Preheat oven to 350 degrees. In a small saucepan place 2 garlic cloves with 4 tablespoons of water together with ½ of the extra virgin olive oil and boil slowly until the garlic softens. Drain the mixture, (through a small strainer) and crush the garlic with a spoon together with the salt, pepper, and oregano. You now have a garlic paste; set it aside. 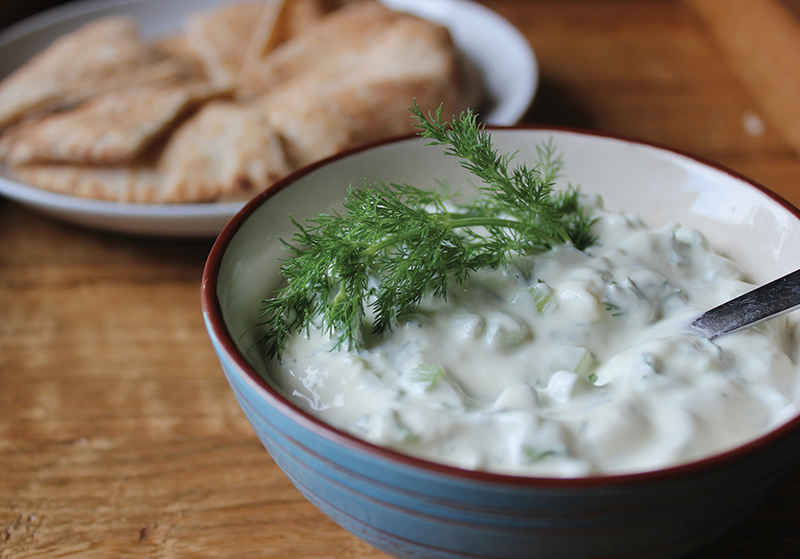 Wash and cut cucumbers in half then take the seeds out; grate them or chop them very small, “julienne” style and squeeze as much liquid out as possible – this keeps the Tzatziki thick. In a large bowl, mix the yogurt, garlic paste, cucumbers, chopped herbs and the remaining 4 tablespoons of extra virgin olive oil with the lemon juice. Mix slowly so that the cucumbers are not crushed further. Refrigerate for about 1 hour and serve.